We believe no job is too big or too small. Whether it is just a simple switch to replace or completely new construction, every job we complete receives the same level of importance and dedication from Monte's Master Electrical Inc.
Monte’s Master Electrical Inc. provides a wide range of electrical services - from replacing outlets, to service changes, to new construction, and more. We cater to both residential and commercial establishments, specializing in personalized solutions for your electrical installation needs. While working hand-in-hand with contractors, home owners, business owners, and anyone else with electrical needs, our tailored customer service leaves a lasting impression. 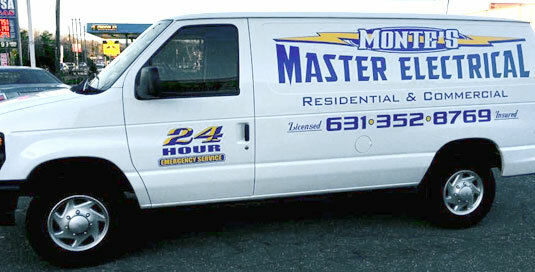 Monte’s Master Electrical has been servicing Long Island and it's residents for almost 20 years, receiving the best compliment of them all - referrals. Family owned and operated, we have built our business mainly by word of mouth from happily satisfied repeat customers, and we plan on doing the same for the next 20 years. We offer 24 hour emergency service to both residential and commercial customers. Electrical fires don't care if there is a birthday party going on or if it is 3am. An electrical emergency needs to be repaired immediately; we will always be there to fix the problem. We strive to get your electrical jobs done as fast as possible. No one likes to wait, especially when it comes to electrical work. We will be sure to always get your estimates to you quickly and your job on our calendar within days of your first phone call. We always offer completely free, no strings attached estimates, so there is never a reason to wonder if you need to have something updated or replaced. We will come in every time and let you know what you definitely need and what you may need in the future. If you can picture it, we can install it. We specialize in custom kitchen lighting to make your kitchen run exactly the way you envision it. The right lighting and sound system can make all the difference in the mood of your busy office or quiet spa. Let us help you design the perfect space for your needs. Copyright © 2019 Monte’s Master Electrical Inc. All Rights Reserved.